“The Free World Charter is a statement of principles that has the potential to optimise life on Earth for all species, eradicate poverty and greed, and advance progress. Everything will be declared free to use, but within an understanding of natural and technical limits, and respect for the combined common good. These understandings are achieved initially through education, and ultimately through consensus. We can agree on the fact that it is through giving everyone access to what we require to live that our living conditions on Earth will change according to stopping living in a survival mode, wherein fear of not having enough money to live will cease to exist. Though, there are key aspects and points that are not being properly addressed and/or considered within their proposal which is lacking the principle and consideration of Equality as the necessary guarantee that will enable this solution to work for all beings in fact. We will be walking through their ten proposals to support with the necessary considerations within the implementation and actions upon such principles wherein we reinstate the need to create an actual management system such as the Equal Money System to ensure that all of these guarantees are in fact implemented and are not able to be violated or corrupted by/ through the ‘human nature’ factor, which is our main point of focus within the current process of presenting the Equal Money System as the overall solution to the current problems that we have created in this world as humanity. This is a document written with the intention and starting point of creating a point of support for everyone that is currently advocating this solution,to see and consider the necessary steps to create a world in Equality. 1. The highest concern of humanity is the combined common good of all living species and biosphere. Human beings, animals and plants are all inseparable parts of nature. We are IN nature – not outside or above it. All our species are connected to each other and the planet, and rely indirectly on each other for survival. Humanity’s physical impact on the World is now so great that we must exercise wisdom and responsibility. We must now consider the needs of all species and the environment, as well as ourselves, in all decisions. Equal consideration of everything and everyone that is here is certainly a key point and starting point for every decision we make in this world. This is taking Self Responsibility as Equal participants within the same ecosystem. The current physical impact on the world is a direct consequence of how we have created a system based on profit, a system where producing and consuming have become the ways to ‘make a living,’ which has lead us to create unnecessary products and ‘economical activities’ that are not required to LIVE, but only exist due to the current need that human beings have to ‘make money to live.’ If we give equal access to what is here, our current system of unnecessary and irresponsible production will stop, because there will be no way to ‘make money’ out of useless products. Within this, a great part of the current environmental impact will cease to exist, as all our focus and attention will not be on ‘surviving’ or producing/ selling to be able to ‘make a living’ or become ‘wealthy’ out of such inconsiderate production, for we will be unconditionally supported as Life. Life is precious in all its forms, and free to flourish in the combined common good. Life is an amazing phenomenon, and, so far, our planet is the only place we have found it. This makes it a most rare and beautiful thing that should be cherished and respected. However, life is also food, and all our world’s species form a complex food-chain. In order to maintain this food-chain – and thus our biodiversity and survival – we must observe the combined common good of all species when interacting with any one. That ‘combined common good’ can only be acquired through/as education, considering what it means to be one and equal, to be coexisting with everything and everyone that is also here in this world doing what’s Best for All. Within this, a way to establish such ‘common good’ must be established at a political level, it must be regulated and implemented through/ as an entire new system structure based on Equality, wherein education is specifically linked to developing beings to their upmost potential within the consideration of everyone having equal responsibility with what is here, as well as equal access to the resources that are here. 3. Earth’s natural resources are the birthright of all its inhabitants, and free to share in the combined common good. Every living person and creature on this planet has an automatic entitlement to share in all the Earth’s natural resources, and to use them to live a healthy and fulfilling life without obligation or subordination to any other person or creature. Humanity, due to population size and complex lifestyle, has a particular duty not to overtax these natural resources, or use more than is reasonably necessary to maintain a happy and wholesome life within the combined common good. Definitely, we are here and we are all part of this world from which we can all give each other access to what is here to Live and within doing so, stop all forms of current ‘economical crisis’ wherein the very basic needs are being denied to human beings, causing poverty and starvation in the same world where there is certainly more than enough for everyone. However, the point of ‘no obligation’ can turn into an actual mayhem because of not having first establish basic principles wherein one would have to learn how to take only the necessary without engaging into abusive forms. Education is required to show how there are consequences the moment that we don’t take self responsibility, which in essence can be witnessed in the current world we’re living in. By giving equal access to everything that is here for human beings, we require a point that establishes such ‘measure,’ to ensure we don’t abuse ever again, to ensure that there are no ways to corrupt the system or compromise each other within this ‘obligation-less’ type of proposal. This doesn’t mean that we will establish ‘limitation,’ but a form of educating how to measure ourselves in what we take, how to realize that within giving equal access to each other, we don’t require ‘more’ to fulfill any other idea of wealth/ power/ superiority. Thus, this must be understood and walked through a process of Education, invariably so. 4. Every human being is an equal part of a worldwide community of humans, and a free citizen of Earth. Social, ideological and border divisions between people are man-made barriers which have no physical or natural basis. Such artificial divisions can only be counter-productive to the common welfare and survival of society as a whole. Our common similarities are, however, both physical and natural. Generally speaking, we all want and need the same things. With universal cooperation and equal access, we can all apply our skills more effectively to achieve these common aims. Agreed. However, how we are currently living as the ‘past’ within ourselves and as our current configuration, we are still playing out/ existing as such separations that exist at a cultural identification and set of values according to where we come from, how we have lived. Within this, it is to consider that we as human beings must walk a process of Self Forgiveness to essentially stop looking at each other as nationalities, cultures, monetary values, races, religions or any other current form of separation that is certainly part of the mind-made/ human-made systems that have no physical correlation to who and what we are as one and equal, establishing Life as the only value that is actually here in this world. Thus, it won’t be as easy as establishing this point of Equality from overnight. There must be a process of self-forgiving the past, the differences, the separation, the hatred that has been bred between human beings and only through that will we be able to stand in equal stance and equal terms. If this process is skipped, what we will have is only a nice set of rules that consider support for all beings; however the nature of each being will be ‘the same,’ existing in perpetual separation and confrontation due to/ because of the current systems that we have lived in our entire lives. Within this, we are declaring that the ‘human factor’ must not be ‘overlooked.’ This implies the necessary process that it will take for humanity to practically and physically adopt and adapt these new set of living principles which must be understood and lived at an individual level first and foremost. Change begins within each one and from here, we expand it into our world and our reality. This is how within the Equal Money System we are walking a process of Self Honesty, Self Forgiveness as the Realization of who we really are as one and equal beginning with ourselves, stopping the patterns of separation and disregard that are currently existing within each human being’s mind. This is what our focus is on at the moment. As we walk this process, we go realizing how it is that the mind must be understood to then see/ realize and understand How we have made of this current system a replica of our mind, it is our image and likeness within that individualization that has lead us to the current disregard of each other as equal. 5. Our community is founded on the spirit of cooperation and an understanding of Nature, provided through basic education. Any child that receives a useful and relevant education into the workings of Nature, the World and community living, will ultimately provide the best service to that World and that community. Traditional career-driven education is now a measurably destructive force. Ultimately, education will replace regulation, which is really only a crude system of maintaining order. For example, a child that fully understands why a certain action is not possible is infinitely better equipped for life than a child who only knows the fear of punishment for that action. Agreed. Education must be based within the realization of actions having consequences that not only affect the individual, but the whole. Education thus must be based upon the principle of Life in Equality and developing common sense in our day to day living actions. Education won’t be another form of surviving in the system or another form of preparing beings to ‘make the most profit,’ it will become part of a being’s life without it having any external motivation as it currently does within ‘making money’ out of any particular job/ task or occupation that one decides to dedicate oneself to. Education must be walked with beings from birth to learn how to consider each other living being as equal and how within a system of Equal-Support, one can focus on developing ourselves to our fullest potential which is what Education should be about in all ways. 6. Our community provides for all its members the necessities of a healthy, fulfilling and sustainable life, freely and without obligation. Every person should be guaranteed the highest technically possible standard of living without the use of money, trade or debt. There is no longer any logical reason not to do this. Virtually all of human suffering is caused by our outdated system of exchange. All forms of debt and subordination are not only a hindrance to progress, but are now completely unnecessary. This is due to our command of technology and the ease with which we can produce and manufacture goods for ourselves. Our current monetary system is indeed outdated and has proven itself to be only a system of control and deliberate disregard of each being as equals. Therefore, we agree: debt is not able to exist in an equal system as it is based on the perception of ‘lack’ which is not common sense and cannot exist in a system where physicality is the matter that we will be ‘working’ with so to speak. Each living being will be given equal access to what is here, as an individual guarantee by the mere fact of being a living being. Though, we are proposing Equal Money as a counting tool to Ensure that such guarantees are in fact taking place in a proper and orderly manner. This is the major discrepancy that we are currently realizing we have toward the World Charter proposal/ system, which is the removal of money in its entirety which is done from the starting point of seeing ‘money’ as the problem in this world, without realizing that money in itself was created by Us, human beings. Thus, it is to educate, support and walk an entire process of Self-Realization as the Equalization of Life as who we really are to see why it is that we have created the current system and How it is our responsibility to now create a system that supports all beings Equally. What this means is that it is not only focusing on how goods/ services will be produced and managed – but how one must ensure that everyone is actually accountable and supported within the system. Through the implementation of Equal-Money we will be able to track all forms of support, how they are distributed, have data bases that can gather information on where and how the system may have inconsistencies/ irregularities or any other form of ‘flaw’ which will then be able to be corrected and ‘tuned’ to get to a sound position again. Without money, how will any form of actual accountability be possible? how will anyone guarantee that all beings are being supported equally in fact? How will we measure any inconsistency/ irregularity? We must remember that it is not that mathematics are flawed, we have created systems and theoretical impositions wherein common sense as what’s best for all is not able to be seen anywhere. This is the description of our current economics which are part of the knowledge and information that has served only some for the purpose of maintaining control and power in reality through/ as money. This is how through the Equalization of money, we remove all ability to ‘have power over another’ – we equalize power for all. 7. Our community respects the limits of Nature and its resources, ensuring minimal consumption and waste. Our resources are limited either by absolute quantity or by the time it takes to manage and replace them. In either case, we must use our resources wisely to preserve both their supply and the environment. In addition, we must minimize our accumulation of rarely used goods, and the amount of non-reusable waste that we produce. These have direct consequences on our environment. The more we conserve our World, the greater our chances of survival into the future. Yes – within the consideration of only producing what is necessary to live, many of the current industries that produce goods only for the sake of profit will disappear. This is then understood from the principle of removing any profit-driven production that has no benefit to life in this world. The wise use of resources also entails proper education which is what should be regarded as part of the actual living skills that will enable each one to be an equal custodian of the Earth as a whole. If we all make sure we take Self Responsibility and ‘do our part,’ we won’t require any form of hierarchical ruling class to place laws and some others to execute them. Within the realization of having equal access to the necessary resources to live, we realize our equal responsibility and how it must be handled within the context of prevention instead of preservation. We definitely agree that the understanding of our direct consequences within the environment are vital to learn how to live in a certain measure. However, if you take money away as a form of having access to such goods/ services, one must ensure that the human being is in fact ready to live in equal regard of everything/ everyone that is here. If this is not in place, we will most likely brew a situation out of control. That’s how Equal Money is required as that necessary point of management to ensure that no one is abusing the system of Equality. 8, Our community derives its solutions and advances progress primarily through the application of logic and best available knowledge. In a new society without financial inhibitors and constraints, the greatest challenges facing humanity will be technical ones. ie. How do we provide enough food, water, shelter, energy, materials, and ensure a high standard of sustainable living for everybody? As opposed to traditional politics and speculation, the scientific method is a proven, robust system of solving these technical problems using just the available facts and basic logic. It also has a common reference across all cultures and languages. Once profit is out of the current scheme of reality, what will remain is the human being having limitless possibilities to explore the most suitable ways to extract the necessary resources and optimal production systems to create the necessary products and provide the services that we require to live. This is also part of what politics is. The current conception of politics must be revisited to be understood as the set of principles that we must base our interaction and communication within society as that equal and one regard and implementation through giving equal access to what is here. Speculation is certainly Not part of what’s best for all and will cease to exist. By scientific method we also understand the practical steps to take the most suitable ways to produce and consume what is here for living purposes. This is also part of the necessary points of education within the system, which is learning how to manage ourselves within a system that can provide for all. Politics will and must not be only regarded as the current political-religious system of parties that oppose each other, but as actual systems and ways that we can convene as humanity to establish the ways to live that are in fact best for all as Equals. 9. Our community acknowledges its duty of care and compassion for members who are unable to contribute. People who, for any reason, are unable to look after themselves or contribute back into society, should be afforded every possible amenity, compassion and care from the rest of the community without obligation. Also, as future contributors to the community, it is vital that we impart as much useful knowledge as we can to our children, in a way that stimulates their creativity, growth and intellect towards future progress. Agreed, by all means each being will be unconditionally supported regardless of their conditions to give back to society what they are being supported with. However this contribution must be accounted and measured to ensure no abuse is existent. This can be done through the regulation with which the Equal Money System will work. At this stage, it is very unlikely that everyone would respect this ‘freedom’ proposed by the World Charter. Giving unconditional support within the realization of who we are as one and equal is what is required to implement. With regards to children, we require to place our focus and attention on to them as they are indeed the future of the world that require to be prepared for the changes that we will be facing within the implementation of an Equality based system. This is how within having a training-ground of how giving to all equally would work, we require to establish equal-money as a form of control in the way of ensuring everyone is actually being supported and no abuse is allowed or perpetuated. This is within the consideration of the ‘human factor’ that we have mentioned before wherein it will not be an overnight process of understanding what it means to live in Equality. This ‘human nature’ factor is what’s being disregarded in this proposal which is not only a key-point to look at, but a decisive factor in any system/ plan/ proposal working into effectiveness or not. We can create the most suitable ‘laws’/ principles to live by in this reality and make it all sound quite nice to everyone’s ears. However, if the human being is not supported through Education to understand, see and realize Why it is necessary to change the current system into an Equality System and How it can be practically and physically implemented through giving Equal-Money for all, we will be most likely only remaining at the level of a utopic idea of ‘how we should live’ without taking the necessary steps to implement it as a new-program within each human being’s mind, which is the current process we are walking as individuals advocating the Equal Money System. If this is not done through an educational process, the Free World Charter as any other current proposal/ solution that is Not considering the importance of establishing a living principle of Equality through Equal Money as a living right, is prone to fail. It will then be forcing beings to only ‘have access to it all’ without any proper foundation or understanding of WHY the current system is not working for all, HOW we created it, WHAT is it that we disregarded that has lead us to our current experience of consequence on Earth and within this seeing/ realizing that each one of us is able and capable of becoming part of the solution if we start applying/ living the principle of Life in Equality as ourselves. This is how we must practically take Self Responsibility for our creation. 10. Our community acknowledges its responsibility to maintain a diverse and sustainable biosphere for all future life to enjoy. We must remember that we share our planet not just with other people, animals and plants, but also with the seeds of future people, animals and plants, who will walk and grow here some day. These beings, who have no voice or influence today, are equally as entitled to life as we are. It is in the interest of all our species to leave the world to our future generations just as we found it, if not better. Agreed. Within a system of equal consideration and prevention, we will learn how to care for all that is here maintaining/ sustaining and even restoring that which has been currently disregarded as an outflow of this current power-driven world. More than ‘sharing’ it is an actual co-existence that must be regarded within the terms of being One and Equal – this is the most important point to realize because this brings any action’s consequences back to Self in all ways. The Earth is unconditionally here, giving/ providing with all that we require to live. We have to stop creating and re-creating all forms of separation in the name of greed, power and self-interest that is what has lead us to our current reality wherein we are very close to self-destruction based on the extended disregard that we have of one another as equals. We are here to establish a system that is Best for All so that we can all finally see what it is to live, what is actual self expression once that we remove our current survival-mode that we have accepted as ‘how life is’ which is absolutely Not so at all. At last but not at least, the main point that differs is the Implementation point wherein we as the Equal Money System, are considering the necessary participation in Politics to establish the Equality System at a political, social and economic level, which will be then placed through a democratic process within the principles of one man, one vote. At the moment I can only read an expected ‘change’ coming from giving ‘free-access’ to everyone within the free charter explanation of how it will be implemented, which is certainly not accurate or specific enough within the understanding of How it is that our current management and functioning is stemming from a political level. We have understood that we cannot ‘change the system’ being outside of the system – or opposing it for that matter – we must support each other to understand that it must be through a political drive that we can all work with and be an active part of through the necessary processes to let people know that there is a new way to live in this world, providing the basics on how and why as well as necessary support to be able to walk the transformation process. Thus, the ‘adoption’ of a new system will come through political means, it won’t happen as easy as just ‘agreeing’ upon it. This is thus why a solution must be structured in equal perfection as the current system that we live in, which is obviously ‘flawed’ in terms of not supporting everyone equally – however, the way that it works proves it is ‘functional’ as a system that must be restructured to support everyone in an equal way. 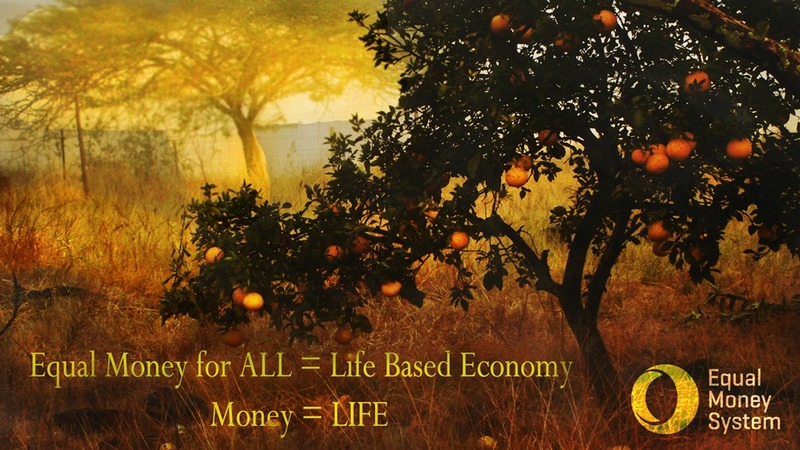 We understand that such change will and cannot be impromptu and immediate, it will take the necessary space and time to implement it and the best way to do so, is becoming part of the people that support an Equal Money System not only as an Equal Access to Life system through the equalization of Money, but as the necessary step to educate ourselves within the consideration of Life in Equality – the one and only community that must exist is humanity living as equals in this world. How to Promote the Equal Money System? #MayDay! But… What Are We Shouting For? Can Self Interest be Common Sense?